This isn't 2019, it's 2018 (continued)....by which I mean that Parliament has returned to exactly the same oppressive sense of impending national crisis as pervaded Westminster before Christmas. The government still seems to be heading for defeat on its Brexit deal, with incalculable consequences for the country. And while the crunch point is supposed to be the series of votes due on Tuesday night, it is entirely possible the crunch may be postponed again; remember government ministers were insisting the vote scheduled for the week before Christmas would not be ducked just hours before it was pulled. Previous promises can be declared inoperative in the blink of an eye. This week's pyrotechnics around the Speaker after he reinterpreted normal parliamentary practice, to allow a vote on an amendment from the former Attorney General Dominic Grieve, appear to have shortened the timetable for Parliament to react - but what did they actually achieve? 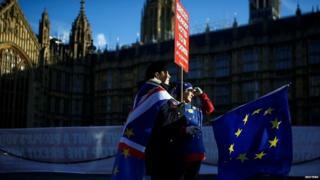 The amendment sought to drastically cut the grace period the government would have between losing a Commons vote on its Brexit deal and announcing what they planned to do next. The original timetable gave ministers 21 days to make a statement, followed by a Commons motion which MPs might amend, within seven days. The updated plan gives ministers three days to put down a motion….but that motion does not have to be debated at a set time and the government would control the timing of any debate, so there could well be a period of limbo before MPs could get their teeth into any government Plan B for Brexit. But I suspect there would be enormous political heat if the government dragged its feet unduly. And having seen a majority for one amendment to speed things up, ministers might find themselves faced with another, if the first one didn't work. In the Commons on Thursday, the government Chief Whip, Julian Smith, denied newspaper reports that there was any plan to restrict the debate to 90 minutes and a single amendment - which would be the default position for a standard proceeding under an act of Parliament, but that timing has often been stretched in the past and there would be huge pressure to stretch it in this case. This is a crucial weekend to test if the government can - against the odds - assemble a critical mass to get an EU Withdrawal Agreement Bill through. If MPs stick by their public pledges to vote against the deal, the government would lose by a devastating 237 votes. Of course some may change their minds or at least abstain, or some faction of Labour MPs might be winnable-over. Who knows? So all of the detail about next week's events is subject to change at short notice. If, for example, Labour proposes a No Confidence motion, it would normally be debated the following day, displacing the scheduled business. MPs begin a momentous week with Defence questions (2.30 pm). After an hour, expect the usual crop of post-weekend ministerial statements and urgent questions. And then MPs embark on day four of the relaunched "meaningful vote" debate. The front bench speeches will focus on global Britain and the economy. The word is that the International Trade Secretary Liam Fox will open for the government, and the Chancellor Philip Hammond will wind up. Maintaining the Brexit theme, the Petitions Committee has scheduled a Westminster Hall debate (4.30 pm) on a series of Brexit-related petitions: numbers 229963, 221747 and 235185, on leaving the EU without a withdrawal agreement, numbers 232984 and 231461 on holding a further referendum, and numbers 226509 and 236261 on not leaving the EU. My committee pick is the Transport Committee hearing on the health of the bus market, held in Liverpool with the Liverpool City Region Combined Authority, Merseytravel, Arriva Merseyside and Stagecoach Merseyside (1pm). But it will also be worth watching the Public Accounts session on Capita's recruitment contracts with the Ministry of Defence (4pm). This will be less about the new "snowflakes" recruitment campaign, and more about the failure to meet recruitment targets over several years, which has left the army seriously understrength. In the Lords (2.30pm) peers have the final day of their parallel debate (the "meaningless vote") where there is a (slightly softened from the original version) Labour amendment which notes that the decision is for MPs, but "considers that a no deal outcome to negotiations under Article 50(2) of the Treaty on European Union must be emphatically rejected, and regrets that withdrawal from the European Union on the terms set out in the Withdrawal Agreement and Political Declaration laid before Parliament would damage the future economic prosperity, internal security and global influence of the United Kingdom." Assuming no change of plans, its crunch time for Theresa May's Brexit plan....expect the tension to be visible right at the start of Commons business, Health and Social Care questions (11.30am). The day's Ten Minute Rule Bill from Labour MP Debbie Abrahams, is on Public Sector Supply Chains (Project Bank Accounts) - the idea is to guarantee prompt payment to small businesses, by ensuring all payments on government and public authority contracts are made through a 'project bank account' system, which would see them protected against the kind of losses many suffered when the construction firm Carillion collapsed. Then comes the moment of truth..... the final section of the meaningful vote debate. The government is wheeling out the big guns in the shape of the Attorney General, Geoffrey Cox (and this is a mark of how rapidly he has moved up the ministerial pecking order since entering government just six months ago), and then the prime minister winding up. Watch out for the Speaker's selection of amendments, which will be made on Tuesday morning. 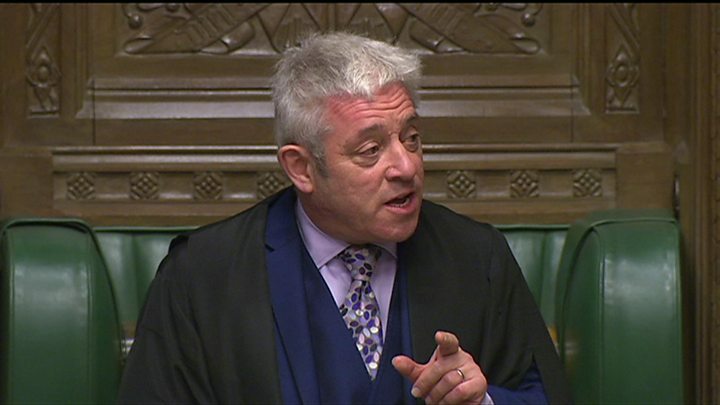 Under the shiny new revised Business of the House motion, he can now select as many as he wants, rather than being restricted to six - in particular, keep an eye out for a last minute "lifeboat amendment" from the government, intended to scoop up votes with a last-gasp compromise offer. Other amendments may evolve a bit, with new versions replacing old as the process of negotiation and compromise between parties and factions continues. The debate will end at 7pm and there will probably be a long series of votes, perhaps taking a couple of hours. And if the result is defeat for the government, the first thing to look at is the margin - a loss by fewer than 20 votes might inspire a "one more heave" attempt to bring a reheated version of the deal back. A bigger defeat might rule that option out. Brexit vote: What could happen next? The second is the reaction from Theresa May and Jeremy Corbyn. Will the PM announce a pivot to some alternative policy? Any major shift could prompt a new wave of ministerial resignations, and maybe even the collapse of her government. Will Jeremy Corbyn propose his long-awaited motion of no confidence in the government (not just in the PM) - a move he will be under huge pressure to make. If he does, that will probably displace the scheduled business for Wednesday. In Westminster Hall, debates include: recognition of fibromyalgia as a disability at 9.30am; the effect of business rates on pubs at 11am; local government funding at 2.30pm; Coventry City football club and football stadium ownership at 4pm, and provision of long-term capital for business at 4.30pm. On the committee corridor, watch out for the Home Affairs session on modern slavery (10am) and the Petitions Committee hearing (2.20pm) about funding for brain tumour research with the Health Secretary, Matt Hancock. The inquiry and committee report followed a petition started by Maria Lester in August 2015, to the mark the anniversary of the death of her brother, Stephen Realf. Stephen, an RAF officer from Rugby, was diagnosed with a brain tumour at just 19 and died at 26. The petition emphasised that brain tumours received only 1.5% (£7.7 million) of national cancer research funding in 2014. It called for funding for brain tumour research to be increased to £30-£35m a year, to help brain tumour research catch up with research into other cancers and diseases. In the Lords (2.30 pm) peers will rattle through a series of third reading debates, starting with the Voyeurism (Offences) Bill, the anti-upskirting measure fast tracked by the government, then comes the Tenant Fees Bill which would ban letting fees and most upfront fees payable by tenants to rent a property. It would also cap the amount of refundable security deposit a tenant would be required to pay to the value of six weeks' rent and cap the amount of holding deposit a tenant could be required to put down to secure a property to the value of one week's rent. Finally, there is the third reading of the Counter-Terrorism and Border Security Bill, which creates a series of new terrorism offences - watch out for technical amendments after the government decided to accept a successful Labour amendment on the issue of designated area exemptions - this is a classic example of how the Lords can polish up the detail of a bill and remove lurking problems before it becomes law. These are followed by seven Statutory Instrument approval motions on: Occupational and Personal Pension Schemes (expected to be taken together); services of lawyers and lawyers' practice; and on civil legal aid. Two SIs on Takeovers and Insolvency (to be debated together) follow. The final SI is on consumer protection. The Commons day opens (11.30am) with Scotland questions, followed at noon by what promises to be (understatement klaxon!) a pretty interesting Prime Minister's Questions. 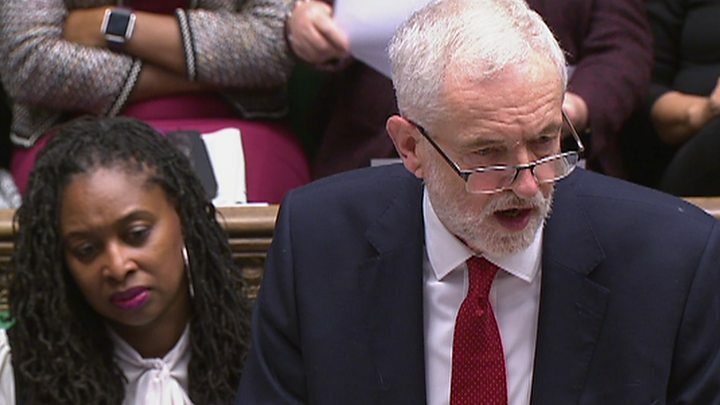 Media captionJeremy Corbyn calls on the PM to end the "costly charade and rule out no-deal"
The Conservative Vicky Ford has a ten minute rule bill aimed at helping postal workers, by discouraging low letter boxes which are a major contributor to back injuries. Her bill seeks to reduce the risk of hand injuries that are brought by low letter boxes, which also make dog and cat injuries more likely - it's working alongside the Communication Workers Union's campaign to change planning regulation for new builds and copy the standard used in Ireland which brings in minimum measurements. What it does not do is seek to force people to change existing letterboxes. Then it's more heavyweight Brexit business, in the form of the second reading of the Immigration Bill, which like a lot of other Brexit bills, gives ministers a series of powers to implement a policy that has yet to be finalised. If this is displaced by a no confidence debate, it may, in turn, displace the backbench business scheduled for Thursday, because the government will be keen to move forward with it. On the committee corridor, the Treasury Committee hosts Mark Carney, the Governor of the Bank of England (9.15am) to talk about the Bank of England Financial Stability Reports. The subject of the economic impact of Brexit may come up. In Westminster Hall debates include the taxation of low-income families at 9.30am, from the Conservative Jeremy Lefroy. He will be highlighting the fact that low income families - especially with a single income - end up by paying marginal tax rates of up to 75% against an OECD comparison of 35%. He believes there is an urgent need to make tax/NI/benefits/Universal Credit system much more family friendly. Other subjects include: representations by MPs to the Department for Work and Pensions on behalf of constituents; the future of the British bioethanol industry and the UK government response to UN climate change conference 2018. In the Lords (from 3pm), questions to ministers range across public support for remaining in the European Union; increase in development rights following the government's consultation: Planning reform: Supporting the high street and increasing the delivery of new homes and a ban on gambling advertising to counter negative effects on younger and vulnerable people. The rest of the day is devoted to debates on a series of select committee reports: the Economic Affairs Committee report, Treating Students Fairly: The Economics of Post-School Education and the EU Committee reports: Brexit: the proposed UK-EU security treaty and Brexit: will consumers be protected? The Commons opens (9.30am) with Environment, Food and Rural Affairs questions, followed by mini question times for the MPs who speak for the Church Commissioners, the House of Commons Commission, the Public Accounts Commission and the Speaker's Committee on the Electoral Commission. Then comes the Business Statement from the Leader of the House, Andrea Leadsom - which could provide some vital clues about the government's next steps. If their Brexit deal has been approved this will certainly include a timetable for considering the legislation to put it into effect, the Withdrawal and Implementation Bill - which will be a huge Westminster event in its own right. Then come two backbench debates, on mental health first aid and on children's social care. The first is on a cross-party motion proposed by Labour's Luciana Berger, the Lib Dem former health minister Norman Lamb, and the Conservative Jonny Mercer who call for the government to change the law to underline that an employers' first aid duties under the Health and Safety at Work Act cover mental as well as physical health. The second debate led by the Conservative former children's minister, Tim Loughton, postponed from before Christmas, is intended to raise concerns about funding shortfalls in children's social care, leading to a deterioration in early intervention and prevention services. In the Lords, the main business is crossbench debates, and there will be considerable interest in the first, on the possible effects of Brexit on the stability of the union. This is led by Lord Lisvane, the former Clerk of the Commons, and will be a vehicle for discussing his Act of Union Bill - a measure designed to highlight the need to sort out the British constitution. It covers a wide range of serious constitutional changes, including devolution, slimming down the Commons, reshaping the governance of the Bank of England and replacing the Lords with a Senate. While it has no chance of becoming law directly, it does raise some important ideas about overhauling British politics after Brexit Day. The second debate is on the relationship between the use of digital technology and the health and well-being of children and young people. The lunch-time mini-debate is on the legislation that would be necessary to enable a further referendum in 2019 on the UK's membership of the EU. The Commons is not sitting, but the Lords meets at 10am to consider a series of private members' bills sent over from the Commons: the Civil Partnerships, Marriages and Deaths (Registration etc) Bill; the Stalking Protection Bill; and the Parking (Code of Practice) Bill.